My first full time teaching contract was in South Korea. I went, in part, for the favourable financial conditions, and for the opportunity to live in a new part of the world that I knew nothing about. 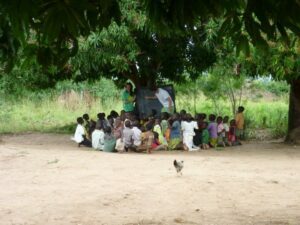 I started teaching English with no TESOL certification and only a few hours of classroom (mango tree) teaching experience. In short, I was not a teacher – I was traveling the world and using teaching as my vessel. When I look back on some of my initial classes, I am embarrassed by some of them. Although I clicked with the children quite quickly (possibly due to growing up with four younger brothers), I didn’t have a clue what I was doing with regards to teaching English. In time I learned my own techniques, and I feel comfortable that in the classroom I gave my best to make the classes as engaging as possible for the children, whilst also trying to broaden their world view and raise their personal aspirations. Whilst I see these as important roles for a teacher to fulfill, I found that the attitude towards education in my school was more geared towards making the children do as many questions from the text book as possible. One child even complained that we weren’t following the book to the letter, so for the remainder of the term, that’s exactly what we had to do – which both the children and I hated. I went on to teach in Istanbul, full-time, in a school where there was no curriculum, around a quarter of the children had text books and half had pens, there was no class register, and all around, there was generally no structure whatsoever, making any form of education near impossible. Having completed a TESOL certification course would had prepared me to plan the lessons myself. It was an extremely unfulfilling job and a far cry from my time in Korea where I actually enjoyed the classes and the relationships that I had with the children. But I am aware that this was my fault because I chose a place to teach that was wrong for me. For me, not having completed a TESOL certification meant that my teaching career was deemed to expire, as I could not progress past poorly paid jobs. I lost interest after a while so I stopped teaching English all together. Some of my co-workers from my time in Korea have moved up to better teaching jobs and they love teaching English because they felt they were true educators from the beginning. I could have completed a TESOL course after my experience in Turkey, but at some point I just didn’t feel like a real educator any more and went on to do something else.